A pie series consists of slices that are defined using the PieSlice type. The slices can have any values as the PieSeries type calculates the percentage of a slice compared with the sum of all slices in the series to determine the actual size of the slice in the chart. Pie size and position on the chart are controlled by using relative values that range from 0.0 to 1.0. These relate to the actual chart rectangle. By default, the pie is defined as a full pie. A partial pie can be created by setting a starting angle and angle span for the series. A full pie is 360 degrees, where 0 is at 12 a'clock. 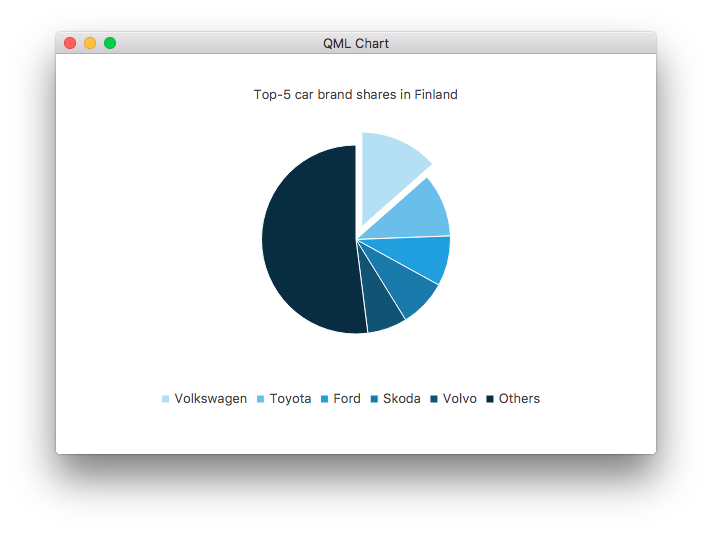 The following QML example shows how to create a simple pie chart. See also PieSlice and ChartView. The number of slices in the series. The ending angle of the pie. A full pie is 360 degrees, where 0 degrees is at 12 a'clock. The default value is 360. 0.0 is the minimum size (full pie drawn without a hole). 1.0 is the maximum size that can fit the chart (the donut has no width). When setting this property, the size property is adjusted if necessary, to ensure that the hole size is not greater than the pie size. The horizontal position of the pie. 0.0 is the absolute left. 1.0 is the absolute right. The default value is 0.5 (center). 0.0 is the minimum size (pie not drawn). 1.0 is the maximum size that can fit the chart. When setting this property, the holeSize property is adjusted if necessary, to ensure that the hole size is not greater than the pie size. The default value is 0.7. The starting angle of the pie. The sum of all slices. The series keeps track of the sum of all the slices it holds. The vertical position of the pie. 0.0 is the absolute top. 1.0 is the absolute bottom. This signal is emitted when the slices specified by slices are added to the series. The corresponding signal handler is onAdded. This signal is emitted when the slice specified by slice is clicked. This signal is emitted when the slice specified by slice is double-clicked. This signal is emitted when a mouse is hovered over the slice specified by slice. When the mouse moves over the slice, state turns true, and when the mouse moves away again, it turns false. This signal is emitted when the user clicks the slice specified by slice and holds down the mouse button. This signal is emitted when the user releases the mouse press on the slice specified by slice. This signal is emitted when the slices specified by slices are removed from the series. The corresponding signal handler is onRemoved. This signal is emitted when the slice specified by slice is added to the series. The corresponding signal handler is onSliceAdded. This signal is emitted when the slice specified by slice is removed from the series. The corresponding signal handler is onSliceRemoved. Adds a new slice with the label label and the value value to the pie. Returns the slice at the position specified by index. Returns null if the index is not valid. Removes all slices from the pie. Returns the first slice that has the label label. Returns null if the label is not found. Removes the slice specified by slice from the pie. Returns true if the removal was successful, false otherwise.